Sonny Liston had 15-inch fists and a 7-foot reach. He was the son of an Arkansas sharecropper, a “labor enforcer” for the Italian Mafia, a world heavyweight champion who learned to box during a teenage prison stint for robbing a gas station. He was powerfully built, illiterate, sullen, violent and withdrawn — a man who did not engender support from the civil rights leaders of the 1960s. Liston is best remembered for loosing two of boxing’s most controversial and most famous fights, one in 1964 and one in 1965, against a man with antithetical looks and personality, Muhammad Ali. You don’t know it, but that’s how you know Liston, too. The iconic image of Ali standing triumphant and raging over the sprawled figure of a boxer was from the second of those two fights. Ali’s muscles are taught and shiny; he looks impossibly powerful. 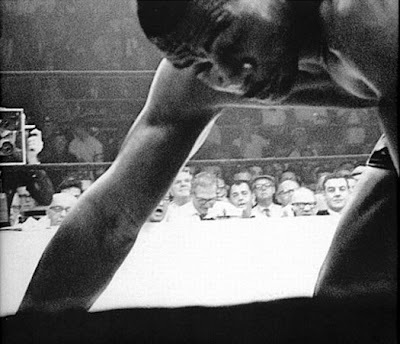 Liston, his face obscured, looks not just defeated but destroyed. That’s the famous photo. The one above was taken as Liston struggled to stand up moments later. He would fall down again, get up and then try to defend himself from a flurry of blows from Ali before the fight was called. The match was fixed. Or at least that’s the predominate theory. He supposedly owed money to his underworld contacts. Or he threw it because he was scared of what the Nation of Islam, which was managing Ali, would do to him if he won. The punch that sent him to the floor was, from some angles, glancing at best. Four former heavyweight champions said he threw the fight. But Sports Illustrated did a frame-by-frame analysis and said he didn’t. Liston was not a subtle man. His acting skills — especially for a man who’d never been knocked down in a match before — weren’t that good. Either way, while he continued boxing over the next five years, Liston’s career was essentially over. He was found dead in his apartment in 1970 from what police described as a suspicious heroin overdose. Liston didn’t know the date of his birth; he was dead for long enough before being found that the exact date of his death is unknown, too. In the footage of the pre-fight weigh-in for the 1964 fight, the locker room is a melee — a mass of people, helmeted police, cameramen and Ali, who formed his own whirlwind of taunts and verbal explosions. Liston looks at once both irritated and tired as he weakly tries to shout rejoinders at Ali over the crowd. Somehow, he looks sad. But maybe that’s because I know what’s facing him. I watch him unsmilingly flash peace signs to the crowd as a doctor checks his lungs with a stethoscope and wonder what it must be like to fall to the ground like he’s about to do. What a deep ache there must be in your heart you try to get back up and your legs fail, and the lights overhead explode like stars, and you collapse with the roar of the crowd and the echoing taunts of a younger, better man ringing in your ears.